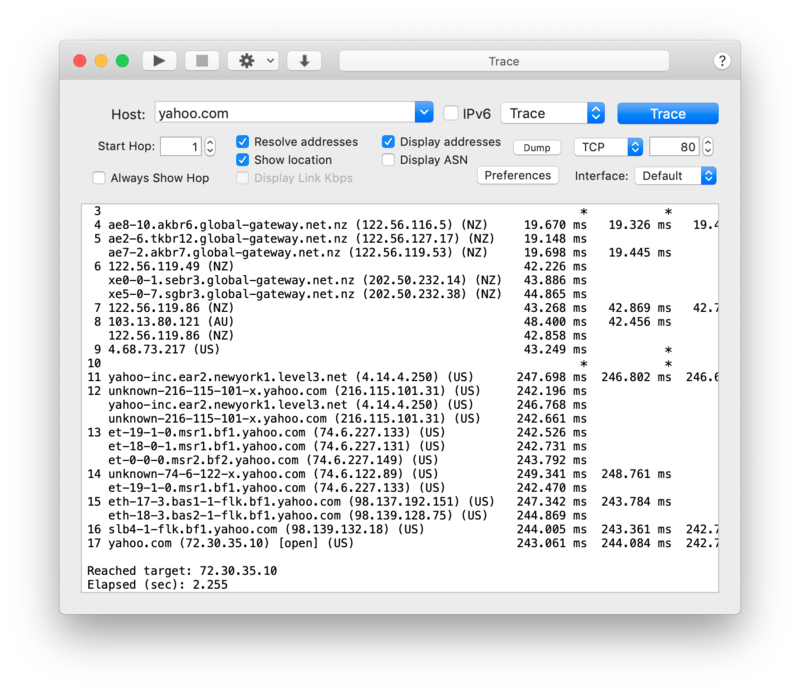 The main window in WhatRoute provides interfaces to many network utilities and commands. See overview for a listing of the functions available. Convenience buttons for starting/stopping a function and shortcuts to common commands. Enter the hostname or IP address in this field. IP addresses can be IPv6 or IPv4. If you have used this host/address previously it will be available in the drop down menu accessible by clicking the down arrow to the right of the field. You can edit the drop down list by using the menu item Edit/Edit Hosts … (or by selecting the shortcut in the toolbar). Select this checkbox if you wish to use IPv6 to Trace or Ping a host. If the Host field contains an IP address this button will be ignored and the appropropriate IP version based on the format of the address, will be used. Use this dropdown menu to select the function you wish to perform. The button to the right will also reflect the name of this function. Click the button to begin executing the function. While the function is executing, the button label will be changed to Stop. The lower part of the window header will show options specific to a particular command. These are usually self explanatory. Trace, Ping, Portscan and Netscan each provide an option to force sending of probes from a specified network interface. Unless you have need for this functionality, it is best to just use the Default setting. Trace options contain a popup menu selector to choose the trace protocol to use. The choices are ICMP (send a ping packet to the target host - this is the default), TCP (attempt to open a connection to the host) and UDP (send a udp packet to closed port on the target host). If you find one method failing then try the alternatives as the results may affected by firewall rules. (If further explanation is required please contact me, bryan@whatroute.net, and I’ll update the documentation). WhatRoute functions send their output to a plain text pane. The text may copied and pasted to other documents or saved to a plain text file using the File/Save … menu commands.